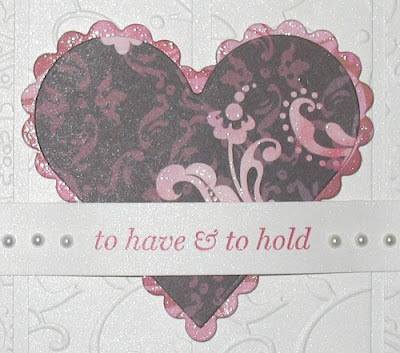 I used the Let's Get Together set from There She Goes and a bunch of really old Basic Grey paper from the Infuse line. I added some Papertrey buttons tied on with crochet thread that I dyed with a little reinker and also used the same thread to stitch around the square piece of PP. I paper pieced both the mug and to go cup, and embossed the panel that the to go cup is on with the Floral Screen embossing folder. The little tag is Cuttlebug and the brad was from my stash. Hope you like them and TFL! Let me just start by saying I don't usually like to play in color challenges because I really LOVE using patterned paper on my cards, and it's sometimes hard to find the perfect colors in PP to match a challenge. 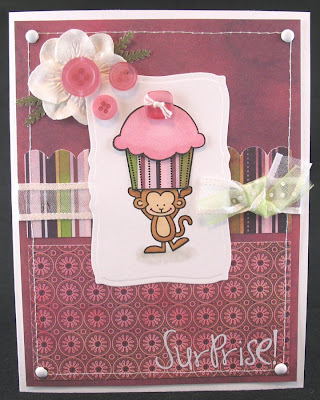 But when I saw the colors that Cath picked for the Moxie Fab challenge, I liked them so much I had to play! 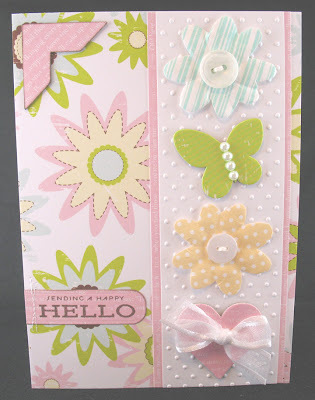 I used Papertrey Ink's set Beautiful Blooms because I knew I wanted to cut out the flowers with the matching Cuttlebug die. I cut the flowers first, and then stamped them with Fresh Snow ink. I also stamped the leaves with Fresh Snow from Spring Moss and Ripe Avocado cardstock, then cut them out. For the background, I cut strips of the same green cardstocks, taped them together, then cut with the biggest of the Nesties Labels One dies. I took the strips apart and embossed them with the Swiss Dots and Birds & Swirls folders, then taped the strips back together. I sewed the buttons on with crochet thread, then added foam tape for dimension. Lastly, I finished it off with some May Arts ribbon and American Crafts glitter chipboard letters. Hope you like it and TFL! 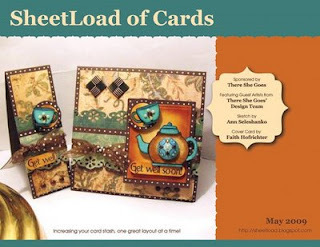 The May 2009 issue of Sheetload has another cool sketch this month, and there is even something called a "scrapling" you can make at the same time as your sheetload. Lots of fun so be sure to check it out! I used the 3 Step Daisy set and a sentiment from Never a Loss 4 Words. I stamped the daisy on white cardstock then cut it out and added foam tape to the back for dimension. I stamped just the first step of the daisy onto the blue paper so I would know where to place the leaves. They were then stamped directly onto the blue paper and I added the cut-out daisy on top. 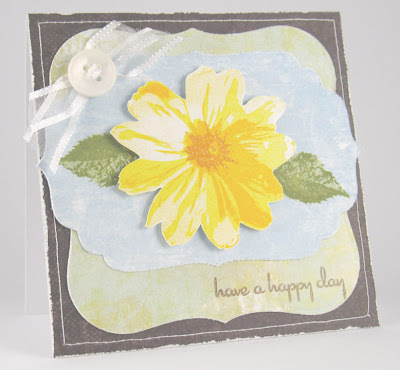 Here are the inks I used, lightest to darkest: daisy (all Stampin' Up!) - Barely Banana, Yoyo Yellow, Summer Sun, More Mustard; leaves (both Papertrey Ink) - Spring Moss, Ripe Avocado; sentiment - Papertrey's Dark Chocolate. My little tip on stamping some of the KSS images: Because the first step ink color is usually very light, it can be a little difficult to see exactly where to stamp the second step. So I just stamp the second step first, and it's easy to see where to stamp the first step over it (hope that makes sense). Then I stamp the rest in order. Card size - 4.25" square. TFL and have a happy day! I'm rushing to get this posted, so I'll update later with all the details! TFL! 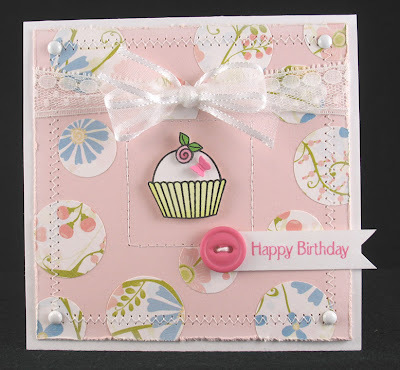 ETA: Materials used: Luvvie stamp - Sugar Nellie; Berry Sorbet and Lemon Tart cardstock - Papertrey Ink; patterned paper - DCWV Garden Party; Copic markers; Long scalloped rectangle Nestabilities; Prima flowers; 1" circle punch and scalloped border punch - Stampin' Up! 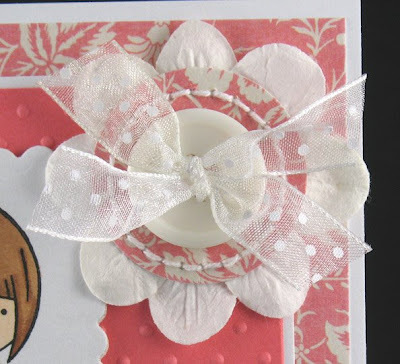 ; heart scalloped border punch - Martha Stewart; Swiss Dots and D'Vine Swirls embossing folders - Provo Craft; ribbon - May Arts; button and crochet thread from stash. It's 4.5"x6.25". I wanted to make it slightly bigger than a regular A2 card so that the panels wouldn't be so skinny. I embossed the panels with the Birds and Swirls and Perfectly Paisley folders, cut the hearts out of more Eva paper with my heart Nesties, and added some little pearls. 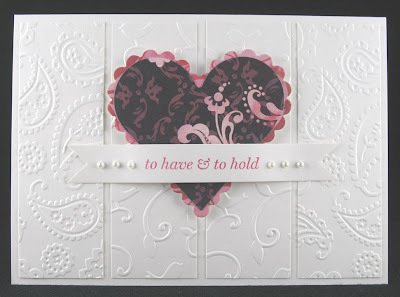 The sentiment is from Papertrey Ink - the limited edition set Simple Little Things, stamped with SU! Rose Red ink. I hope you (and the couple!) like it and TFL! Little details: I paper pieced her dress, added a little heart pearl over the drawn heart in her hair, cut her out and popped her up with foam dots. Last thing - just a forewarning: I got a great deal on a couple full-sized Basic Grey Eva paper packs so be prepared to see a LOT of Eva on my blog! 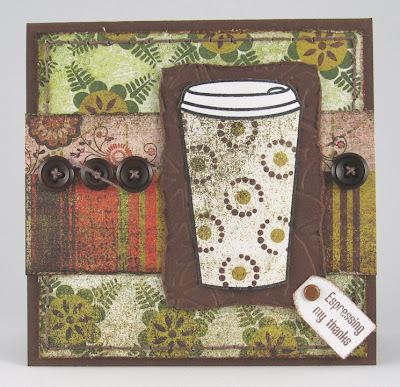 Other materials used: sentiment - Papertrey Ink (Beyond Basic Borders); patterned paper - Basic Grey Eva collection; small tag - Cuttlebug; Nestabilities Labels 4; Copic markers and airbrush system; flowers and buttons - Making Memories; leaves - Prima; lace from stash. 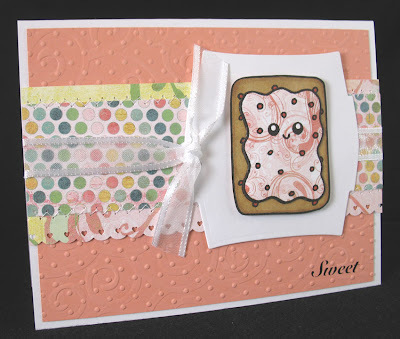 Because I used papers with swirls and dots, I couldn't decide which to emboss the background with so I did both! First I ran through the piece with the D'Vine Swirls folder, then I ran it through again with the Swiss Dots folder. The swirls mostly flattened out with the second run through, but you can still see them and I think it's a really interesting pattern. The patterned papers are from Basic Grey (very appropriately the Two Scoops line), and the Berry Sorbet cardstock is from Papertrey Ink. The ribbon is May Arts and the rubon is Cosmo Cricket. 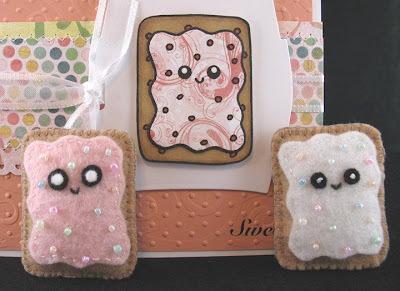 And here's the more I was talking about - I made little felt versions using the stamp as a pattern! I only put "sprinkles" on the frosting portion, and I played with the eyes a little trying to figure out exactly how to make them. 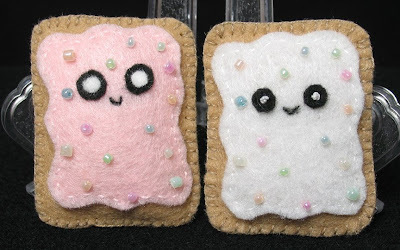 Since they're so small, I had to make them slightly bigger to do them out of felt. I LOVE how they came out and have been looking at my other stamps to see if they would make good felties! Hopefully I'll have more to share with you later. TFL and have a great day! The cupcake is from the Susie Surprise set from The Greeting Farm and the sentiment was done with some super old Making Memories rub-ons. Hope you like it and TFL! 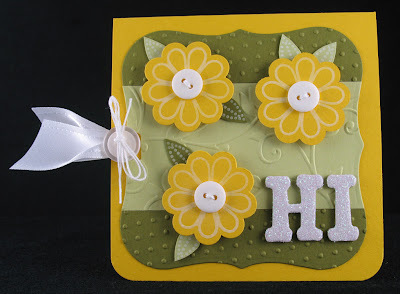 Other materials used: patterned paper - Basic Grey (Eva paper pad); white ribbon - May Arts; green ribbon from stash; flowers - Prima; buttons - Papertrey Ink; scallop border punch - Stampin' Up! ; brads - Pink Hedgehog Papercrafts; Copic markers; small fern punch - CarlaCraft; Mega Curved Rectangles Nestabilities. To embellish, I added Papertrey buttons tied on with crochet thread to both flowers, some little pearls to the butterfly, and May Arts ribbon to the heart (which was punched with the Crop-A-Dile II so I could thread the ribbon through it). The corner was done with the Stampin' Up! punch, then sentiment block was cut with a Spellbinders die, and the sentiment is from Papertrey Ink's Limited Edition set Everyday classics. The size of the card is 4.5"x6.25". I have a box of off-size invitation envelopes and that's what size card fits in them. I used this size because my 4 embellies were a little too large to fit on a standard A2 size card. I hope you won't get tired of the Garden Party stuff because I have a bunch of it and I plan on using it! TFL! I used Papertrey Ink's Simple Alphabet for the sentiment, the tiny heart from Sweet Love, and 3 different cupcake images from The Greeting Farm's Susie Surprise set. First I cut strips (2.5" x 8.25") from various pieces of blue cardstock, then scored them on my Scor-Pal at 3", 3.5", and 7". 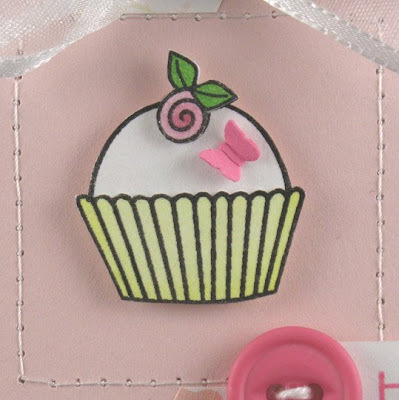 Next, I stamped all the different elements and punched the top edge with the Stampin' Up! scallop border punch. 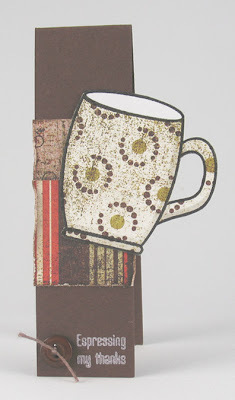 Then I punched holes in the tops using the Crop-A-Dile II, then embossed them with the D'Vine Swirls embossing folder. 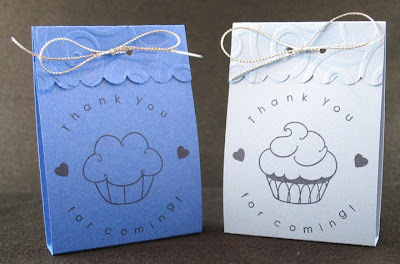 Lastly, they're tied shut with silver cord from Stampin' Up! I ended up making 44 and they actually went really fast! You can see from the view above that each "matchbook" contained a shortbread cookie shaped like a pineapple. 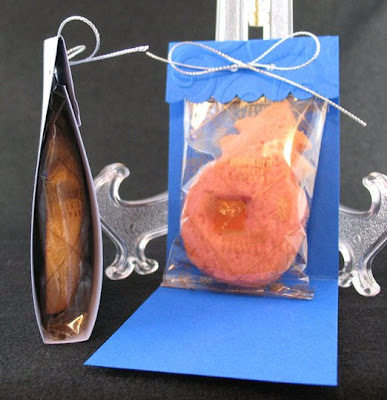 They're from the Honolulu Cookie Company and they're yummy! I didn't want to punch through the cookie packaging so they're just stuck in there with a tiny bit of double stick tape. I hope everybody at the party likes them, and I hope you like them too! TFL! !